Not surprisingly, the traffic leaving Paris was horrible, so we had fallen behind schedule. Despite that, I insisted that we stop at the Château Chambord on our dip southward to Anjou. It had been over two decades since I last saw it. Although we arrived too late to enter the castle grounds, we paused to marvel at the massive, Renaissance structure, blushing with the pastels of dusk. It’s hard to believe that this, the largest châteaux in the Loire Valley, had been intended merely as a hunting lodge, a boastful show of wealth and power by its builder Francis I. 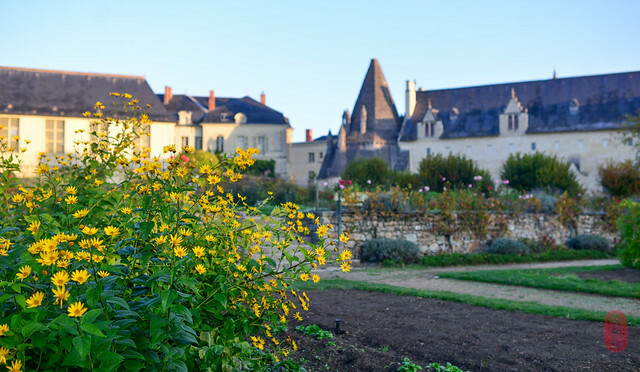 My friends Colby and Megan Garrelts and I soaked in the silence of that sprawling estate – which we had to ourselves – before hopping back in our rental and speeding off towards Fontevraud. Night had fallen as we pulled up to the ancient gates and rang the bell. 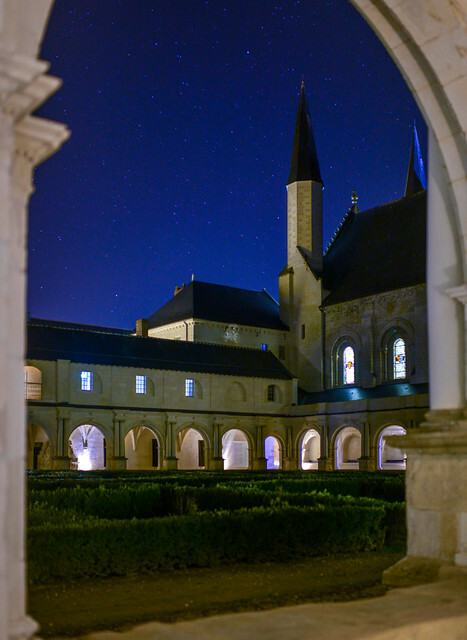 Fontevraud was a monastic order and abbey founded nearly a millennium ago under the rule of the Angevin empire. Once known for providing shelter to women of all levels of society, due to its royal patronage, it later became a favorite refuge and retreat for the nobility. In fact, Eleanor of Aquitaine, that medieval heiress to one of the largest and wealthiest territories in Europe of her time, which helped put her on the thrones of both France and England, had been the abbey’s earliest benefactress (for an excellent biography, I recommend Alison Weir’s “Eleanor of Aquitaine: A Life“). After firmly establishing the Plantagenet dynasty by producing a shockingly large brood of heirs, she retired from court life to Fontevraud. She died and was interred here, along with her second husband, Henry II of England and two of their children – their son Richard I of England (also known as “The Lionhearted”) and daughter Joan of Sicily. 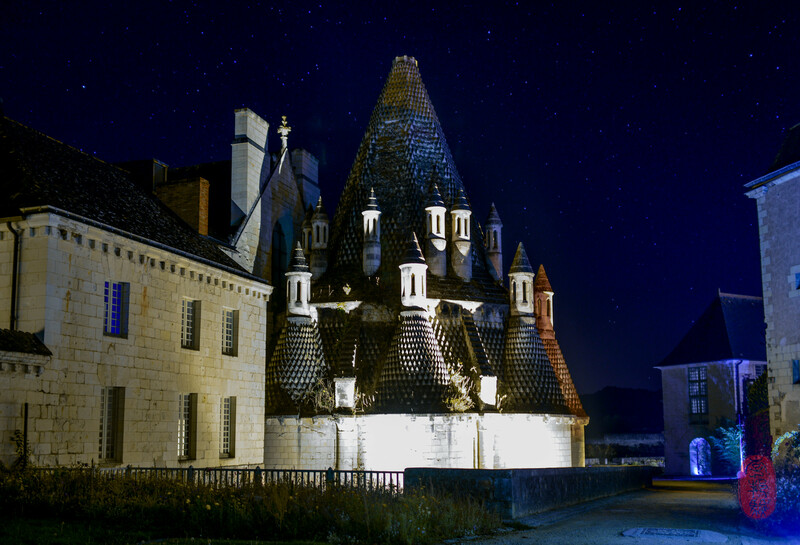 Hermetically sealed from the few, sleepy villages that dot the area, Fontevraud remains within a walled compound to this day. The ancient buildings now comprise a museum and a hotel, the latter of which is housed in a priory. Even if we had arrived early enough to have dinner at the hotel’s main restaurant, it would have been closed that day. It’s a pity, since I had watched the head chef Thibault Ruggeri win the Bocuse d’Or in Lyon in 2013. And I would have loved the opportunity to eat his food. In fact, at that late hour, we were lucky to get anything to eat at all. 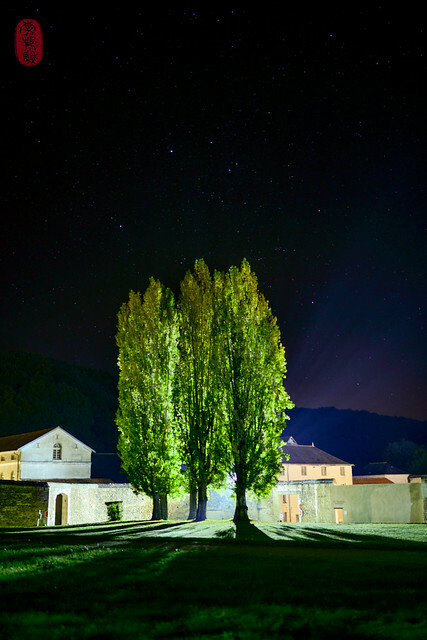 As we checked in, the front desk informed us that our last option within miles – a bistro in the hamlet just on the other side of the abbey’s walls – had just closed for the night. And due to a private party, the hotel’s more casual bar eatery was closed as well. But realizing that we were without options, the hostess rang the bar kitchen and asked if they could put something simple together for us. Grateful for the generous accommodation, we put our luggage in our rooms and rushed downstairs. We learned that the hotel had recently come under new management. 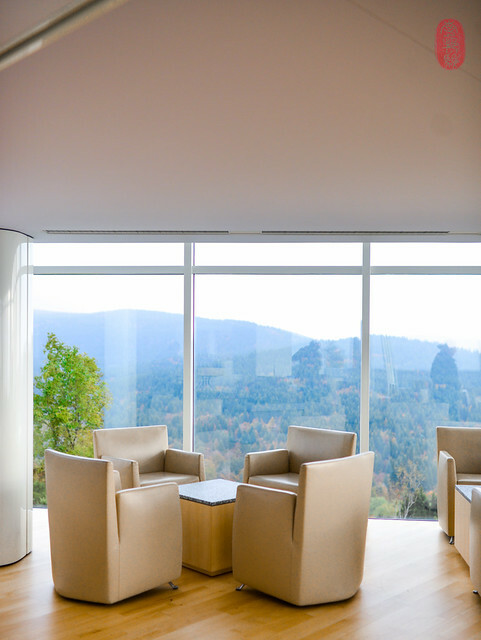 The resulting renovation was evident. In stark contrast to its ancient structure, the hotel’s interior looked and smelled new, with wooden fixtures and furnishings designed in a minimalist style. Nowhere was this juxtaposition of old and new more apparent than in the hotel’s “bar,” which was housed in what had originally been the priory chapel. The cavernous space with high, vaulted ceilings was grand, filled with only a few, starkly simple wooden booths. Our table doubled as an interactive, electronic screen that offered an historic and virtual tour of the abbey. Novel though it was, there was no way to turn it off. And that was annoying. But, we were lucky to have a table at all. And, having traveled all day without eating, we were even grateful for the short “prix fixe” dinner, which can best be described as a bistro bento box, with three “courses” arriving together on a tray. There was a fist of rabbit pâté wrapped in caul fat. There was “paella” (which wasn’t good enough to stand alone without the scare quotes), and a much better piece of beef. We washed all of it down with a bottle of Chinon from a winery up the road. Sufficiently spooked, the three of us headed back to our rooms, serenaded by a pack of wolves in the distance falling on some wretched creature wailing to its death. It was surreal. Daybreak revealed a hoary frost that had coated everything with a dull glisten. Breakfast in Europe is almost always a delight. 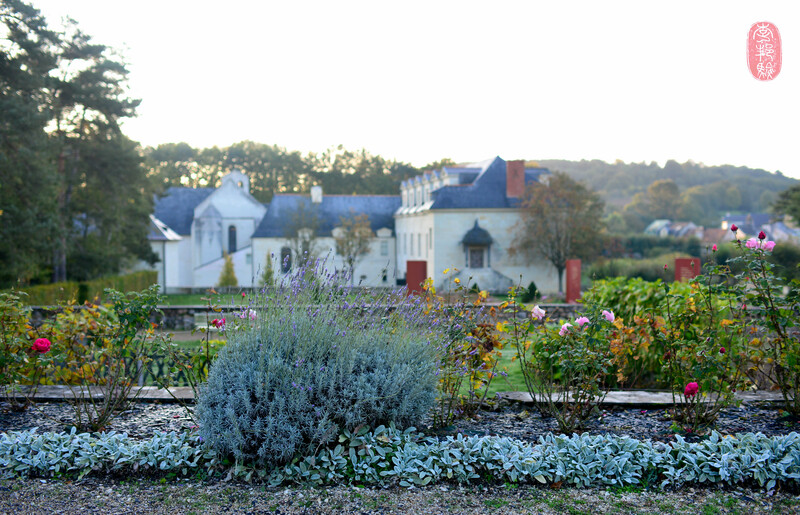 And breakfast at Fontevraud – included in the price of our rooms – was no exception. Served in the small cloister of the priory, it included a simple but excellent spread of jams and juices (including pear) and cheeses and meats. There was coffee, fresh fruit, and breads of all kind, including one that could have been mistaken for chocolate cake. After breakfast, we returned to the abbey for a better look at some of the frescoes and rooms that had been too dark to appreciate the night before. I was especially thrilled to find the colorful and shockingly well-preserved effigies of Eleanor of Aquitaine and three of her family members in the abbey’s church. Sadly, their royal tombs were raided during the French Revolution, and the whereabouts of their remains – if they still exist – are unknown today. Turning southwest, we headed towards the breathtaking puys of the Auvergne, which were ablaze in a patchwork of autumn colors. It was a gorgeous, sunny afternoon when we turned off a lonely country road to climb the narrow, winding drive up to Michel Bras’s stunning property. 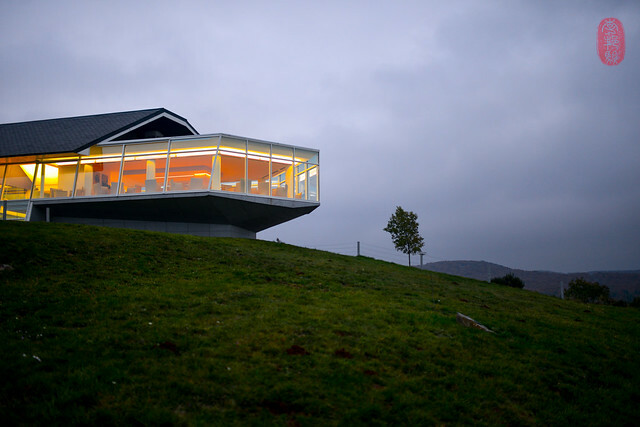 The restaurant perched on a steep hillside, jutting out like a shiny spacecraft, offering a breathtaking survey of the rolling countryside of Laguiole below. Shingled down the slope were about a dozen guest rooms, all built into the side of the hill in an earth-contact fashion, as if emphasizing the Brases’s focus on terroir. In our rooms, too, were wonderful reminders of the land around us: soap and shampoo made from local vegetation, soda infused with herbs from the area, and a backpack with a map of the grounds – an invitation to explore. But, as we settled in, a thick curtain drew across the sky, chasing the warm afternoon, and our hopes for a quick hike, to an abrupt and unexpectedly chilly end. By the time we headed to dinner, autumn had turned to winter. As I had written in an earlier blog post, Michel Bras had not been high on my bucket list. 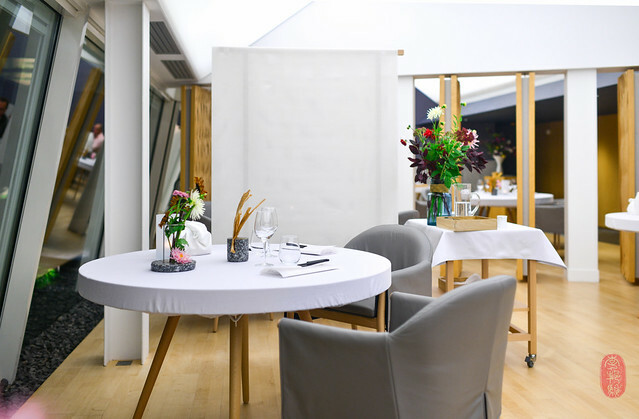 First awarded three Michelin stars in 1999 (a distinction it has held, uninterrupted, since), the restaurant had, in the estimation of many, lost its relevance some time ago. But relevancy has never driven my dining agenda (although it has, undeniably, influenced me). If anything, I usually greet relevancy with skepticism. But Michel Bras is, perhaps, an exception. Once, it had been the kitchen to which all kitchens looked for innovation and aspiration – was there a cookbook of its time that made more of an impact on fine dining worldwide than Bras’s? Relevancy was this restaurant’s raison d’être. And that relevance then, however irrelevant it might make Bras seem now, is what I wanted to experience. So, the restaurant’s irrelevance now was not my fear. My fear was change. Had Sébastien Bras, who had inherited his father’s toque some years ago, taken the restaurant in his own direction? Or, had he attempted to preserve his father’s menu? What if he was trying to do both, and as a result, doing neither very well? I suppose it would be unfair of me to expect Bras the younger to soldier on, curating his father’s culinary museum out of filial duty or a sense of obligation to chefs, tourists, and “foodies” who travel from afar. Even more cruel would be to assume that he couldn’t possibly have anything worthy to add to his father’s legacy. I’m sure it’s no mistake that the restaurant’s name – Bras – is cast generously enough to ascribe authorship to the family at large, if not at least both father and son, now that the baton has been handed off. But Sébastien Bras is certainly not the first or only to live in the shade of an agnatic shadow, one which stretches across many culinary dynasties: the Pacauds at l’Ambroisie; the Troisgroses and Pics at their eponymous maisons; the Arzaks of Spain; and the Santinis of Italy, not to mention the long-standing generations that have populated Japan with countless sushiyas and kaiseki establishments. My wishes and expectations of Bras were unfair. I had missed Bras when it was Michel Bras. And I shouldn’t wish it back under different circumstances, should I? It wouldn’t be the same. So, although Bras had become relegated to a lower rung of my checklist, I suddenly found a renewed interest and excitement for it. We had not expected to find chef Michel Bras at the restaurant. And, indeed, he was not there. But his son Sébastien greeted us in the kitchen, and Sébastien’s lovely wife Veronique welcomed us at our table. The food was good. Actually, it was very good. Everything was cooked correctly, and the flavors were true. Faithful to terroir, the cooking showcased the ingredients at their prime, many of which were from the surrounding land. This ethos has become the Bras legacy – started by Michel, and now reaffirmed under Sébastien. From our tasting menu, four dishes stood out. First, there was Michel Bras’s famous “Gargouille,” presented as ‘l’Aujourd’hui, ‘Classique. 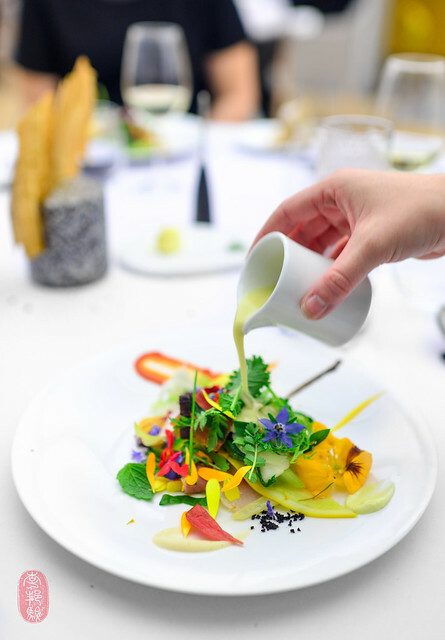 '” Not only was the variety in this salad impressive – composed of nearly three dozen herbs, flowers, and vegetables – but so were the colors, especially at that late hour in the season, when the garden usually drains of all hue and humor. I’ve had many versions of this dish made by chefs who were inspired by this original, which I now consider worthy of its reputation. What I especially loved about it was the warm, velvety vegetable sauce poured over the salad – a dressing – that transformed what appeared to be a bright and light salad into an unexpectedly comforting and hearty dish. There was also a thick slab of foie gras, “ni chaud ni froid” – “neither hot nor cold.” The most remarkable thing about it was the texture – as silky as custard, but sturdy enough to cut with a knife. It wore a beautiful, golden crust, and yet leached no oil. I can’t say I loved it – I prefer foie gras as pâté. But, I appreciated it for the flawlessness of the technique and craftsmanship. And, together with the three, slightly dried grapes, which burst with sweetness, it was certainly delicious. Arriving with our beef course was a giant bowl of aligot, a regional dish specific to l’Aubrac. Our captain started whipping the mashed potatoes, which had been mixed with uncured cheese, until it became surprisingly mastic. Pulling thin ribbons of aligot high into the air, he gracefully rolled them around a spoon. Moving quickly, he transferred the aligot, which remained intact while in the orbit of his confidence, to individual bowls, where he let the soft mass finally settle. It was magical. When I looked up, Megan was in tears. For me, the aligot was far more memorable for its table side show than for the eating. Beyond the novelty of it, I appreciated it most for its texture – there was an elasticity and snap to it that was strange and wonderful. Lastly, near the end of our dinner, we were served Michel Bras’s famous coulant, about which I had written in an earlier blog post about my favorite desserts of 2015. Date-stamped 1981 on the menu, Bras’s “molten chocolate cake,” one of few claimants to being the original (some also credit Jean-Georges Vongerichten), has had an undeniably wider reach than his Gargouillou. The version we were served was infused with Tahitian vanilla and served with butternut squash ice cream and a brown butter coulis. It was terrific. We finished the meal with a cheese cart, which offered a beautiful selection from the region. 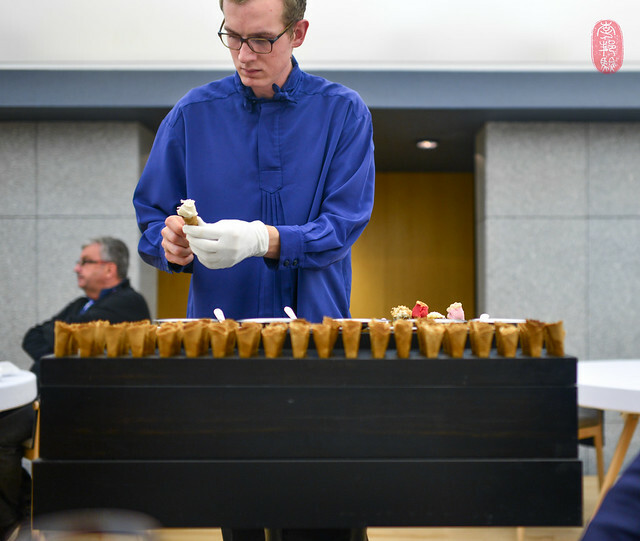 And, at the end, our table was invaded by a phalanx of mini ice cream cones, which our server filled with a rainbow of flavors. Our hometown Kansas City Royals were in the playoffs for the second year in a row after a thirty-year absence (having made it to the World Series the year before, we were defeated in the seventh game). While I am a shameless bandwagoneer, Colby Garrelts is a die-hard fan. As our dinner drew to a close, he became restless in anticipation of the upcoming game. When our captain came to our table for one, final sweep, Colby asked if the restaurant could send a bottle of wine to his room. They happily obliged, and Colby spent the night blissfully live streaming the game with some nice juice. We awoke to snow. And it was glorious. And so was breakfast, which I included among my five favorite meals from 2015. 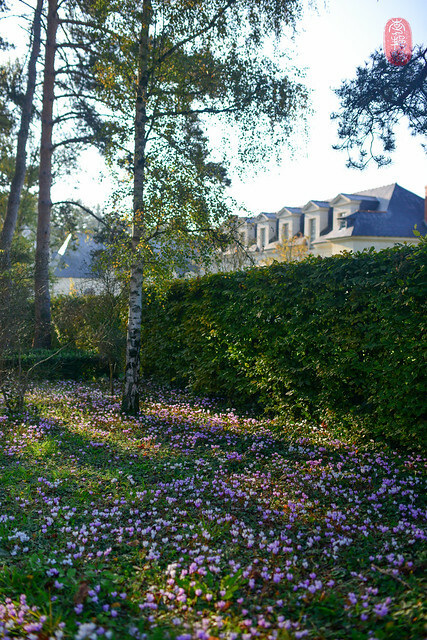 As with many European restaurants that are attached to their own inns – like Le Grenouillière on the northern coast of France, in de wulf in the Belgian countryside, and Fäviken Magasinet in the northern reaches of Sweden – an overnight stay at Michel Bras, and, especially the breakfast, were the highlight for me. In my blog post last year about my trip to Fäviken Magasinet, I had weighed the value of destination dining. I concluded that the value was rarely in the destination, but rather the journey and, especially, those with whom you share it. This trip was no exception. Dinner at Michel Bras was very good. Admittedly, it was better than I had expected. And breakfast, as I said, was a showstopper. But, as we unwound our way back down to that lonely, country road, with Colby dozing off to recover the night he sacrificed to the playoffs (the Royals went on to win the World Series, the first time since 1985), I thought not of our dinner, or our breakfast. Rather, I marveled at that ancient abbey, which had sheltered kings and queens, and little old me. I remember run-walking through the night with Colby and Megan in nervous silence as wolves bayed in the moonlight. I warmed at the thought of the Bras family, who had been unspeakably hospitable – as we left, we spied a class of grade school children in the kitchen getting a hands-on tutorial in that Michelin-starred kitchen as a part of the “semaine de gout” (a weeklong tradition where French children are exposed to the culinary world); Veronique Bras had also handed us gift bags stuffed with books and videos and other goodies from the Bras gift shop; a generous parting gift. 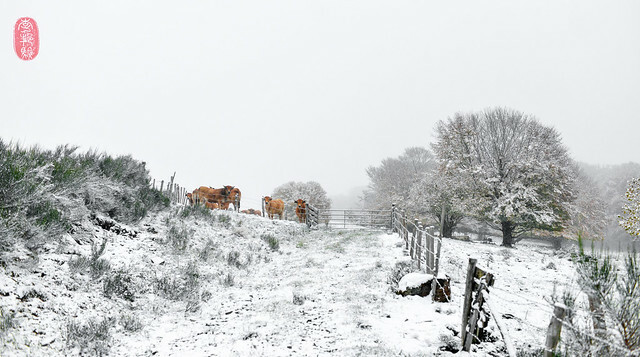 And now, as we headed back north, I soaked in the stillness of the Aveyron, blanketed in the year’s first snow. Suddenly, our six-hour drive back to Paris didn’t seem quite long enough. You will find all of the photos from Fontevraud, l’Abbaye Royale here, and all of my photos from our trip to Bras here. 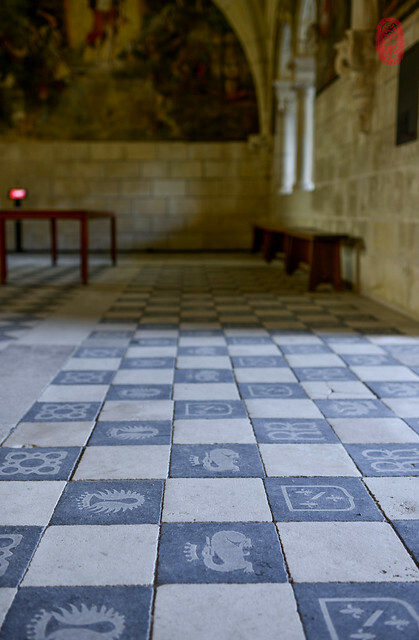 Photos: Flowers in the morn at Fontevraud, l’Abbaye Royale; Château Chambord at dusk; tiles at Fontevraud; a patch of flowers at Fontevraud; two photos of Fontevraud at night, the latter of which was taken inside the cloisters of the main abbey; a tower of the main abbey at Fontevraud; a rose and herb garden in the frosty morning at Fontevraud; Bras, perched on the side of a hill above Laguiole; whipping aligot at Bras; “l’Aujourd’hui ‘Classique,'” a salad at Bras; the dining room at Bras; mini ice cream cones at Bras; cattle on a snowy hillside at l’Aubrac, just outside of Bras. ~ by ulterior epicure on April 18, 2016. Thank you. I live vicariously through your photos and writing. Thank you. I live vicariously through the images and the imagery you fashion through your writing. I have been following your blog for close to ten years now. Over that time I have watched your writing, tastes and photography evolve. Looking back, I can draw interesting parallels between your journey and my own. I read it religiously throughout my undergraduate degree, amidst busy mess halls stuffed with students and research labs stuffed with mice. Finals-season study breaks nearly always included a quick check for new posts. I would often save unread posts for an occasion when I had a favorite snack or meal to enjoy whilst reading. During graduate studies, late night research breaks were often punctuated by re-reads of my favorite “Best of” lists. Times of excessive procrastination typically involved repeated daily blog checks. Dry spells, with no posts for months at a time (a la Chuckeats), would leave me paranoid that you had finally left the blogosphere for good. And now, as I enter my final year of medical school (and running on 3 hours of sleep for 48 hours of call), I am spurred to write you this note. It’s probably a bit of post-call delirium. This blog has allowed me to live vicariously through you and has helped me maintain my sanity through countless hours of studying. I like to think that my culinary bucket list would make you proud. I hope to visit them in the near future and I will certainly think of the relevant UE post as I visit each one. This blog is my internet safety blanket. Thank you for continuing to write what I consider to be the most interesting, articulate and thoughtful culinary blog on the internet. Thank you both very much for following – and especially you, Barry C, for a decade! You honor me with your kind words. I’m very lucky to be able to travel and eat like I do, and I’m so glad that by sharing it with others, that people like you can also benefit from it. Wow glad you had such a luxurious experience, it seems to have started rough so I am glad your stay got better. As per usual it is the journey not the destination.